Have you been looking for simple, effective car seat cleaners that lift stains from upholstery, carpet, and other car fabric? I have, too, and there are many good car upholstery cleaners available today. Each car fabric cleaner I’ve tried has its benefits and drawbacks. In my opinion none are perfect, but they’re all effective. My favorite car upholstery cleaners have foam sprays because they seem to offer more predictable, even results. In my experience, the non-foaming sprays tend to leave behind uneven streaks of clean fabric. They also drip when applied to vertical surfaces like seat backs, and the drips cause frustrating stains that run down the length of the seats. Did You Know?… You should specifically buy car upholstery cleaners when you want to remove stains from car seats, carpets, and fabric. Why? Because other fabric cleaners – like household carpet sprays – are usually overly concentrated for use on car fabrics and may permanently discolor or stain those surfaces. I was looking for a new car fabric cleaner to clean the inside of my 2006 Chevrolet Malibu, which has light-gray fabric seats. The interior of my car still looks decent after 10 years and I intend to keep it that way. I really take pride in driving clean, well-maintained vehicles and need a fabric cleaner that will help me keep my car’s cloth interior clean as easily and efficiently as possible. Note that none of these spray cleaners are specifically designed for use on leather. If you’re looking for a car leather cleaner, be sure you seek out cleaning products that are designed for use on leather – which could be easily damaged by the cleaners I’m reviewing in this article. I’m also going to throw this disclaimer out there: before you use any of the car seat cleaners listed in this post, please test them on an inconspicuous area of fabric to ensure they won’t stain your upholstery! Some other cleaners have stained my fabrics, so learn from my lesson and take this warning seriously. Finally, and most importantly for the sake of maintaining my journalistic integrity… I am in no way employed by or have financial stake in any of the companies whose products I review in this post. I bought all of 3 of these car seat cleaners on the same day at a Walmart in Central Florida and am not being reimbursed or compensated by the companies in any way for these reviews. OK, now let’s get this car fabric cleaner review on the road! In my opinion, the Turtle Wax OXY INTERIOR 1 Multi-Purpose Cleaner & Stain Remover is a highly effective foam spray cleaner that’s perfect for spot cleaning deep stains. It also comes with a plastic brush head to rub the foam cleaner into the fabric. This Turtle Wax car cleaner, which boasts an OXY cleaning formula, is the best I’ve used for removing the worst stains – including grease, coffee, pop, mustard, etc. (Yes, I love my fast food.) In fact, the Turtle Wax car fabric cleaner even removed a grease stain from a leaky bottle of sunscreen! The highly concentrated formula does tend to streak if sprayed unevenly and if not properly rubbed into the fabric. Also, the brush head is great, but there’s one huge drawback: you can’t remove the brush! The Turtle Wax cleaner effectively removed the stains from my car seat, but I really had to watch out for the overspray on parts of the fabric I wasn’t cleaning. The splattery overspray left behind irritating spot stains on areas of the fabric I wasn’t planning on cleaning. TIP #1: The foam spray shoots out from the middle of the brush head. So, for the best results, you’ll need to release the spray when the brush is directly on the fabric surface to help contain the foam spray stream only to the area you want to clean. TIP #2: Be sure to feather the foam spot cleaning job into surrounding areas of the fabric – so the spot removal site looks more naturally blended into the areas of the seat you don’t plan to touch. Aside from its splattery overspray and unremovable plastic brush head, the Turtle Wax foam car cleaner is definitely a good buy – especially if you need to remove heavy stains from small areas of your upholstery. I think the Shout Auto Multi-Purpose Cleaner is effective on stains but not quite as powerful and concentrated as the OXY cleaner in the Turtle Wax spray. The overspray problem is not as frustrating as with the Turtle Wax cleaner, but there was still some challenging side splatter. I also like the size of the spray button on the Shout auto cleaner. It’s wide and comfortable to use for long periods of time. TIP: If you’re trying to remove difficult stains like coffee, makeup, or oil, I definitely recommend using the Turtle Wax car seat cleaner (above) for lifting the stains. One factor that I think makes the Shout car cleaner a little easier to use than the Turtle Wax car cleaner is that Shout’s spray can has a removable brush head, which is convenient. It’s easier to finagle a brush you can hold and manipulate in your hand than to use a brush that is affixed to the top of a spray can. If you want a convenient, all-around foam cleaner that’s easy to use and comes with a brush apparatus, try the Shout Auto Multi-Purpose Cleaner. Of all the car seat cleaners I’ve tried, my favorite all-around fabric foam spray is Tuff Stuff Multi-Purpose Foam Cleaner. Another benefit to using Tuff Stuff spray is that because it’s so versatile, I can safely use it on a variety of surfaces – not only those within car interiors, but also tile, formica, porcelain, and other common household items. It takes a few applications to remove deep stains like coffee and pen ink. It’s not as effective on grease as the Turtle Wax multi-purpose cleaner. The size of the spray button is small – which means it’s more uncomfortable to depress for prolonged periods than the sprayers on the Shout and Turtle Wax spray cans. Like its competitors, the Tuff Stuff cleaner isn’t perfect. However, Tuff Stuff foam cleaner is a good, no-frills fabric and upholstery cleaner. So, What’s My Final Verdict? 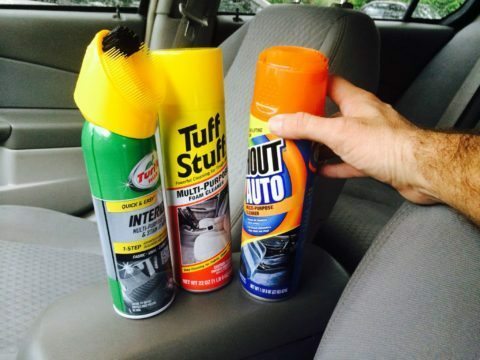 I like all 3 of these car upholstery cleaners for different reasons. Turtle Wax Oxy INTERIOR 1 Multi-Purpose Cleaner & Stain Remover — I prefer this cleaner for removing unusually difficult stains from my car seats. However, I find the formula too concentrated and the can’s brush too awkward to use for general purposes and for cleaning the entire interior. Tuff Stuff Multi-Purpose Foam Cleaner — I love Tuff Stuff for general cleanings and use this product most frequently. There is no streaking and also very little overspray – making Tuff Stuff more predictable to use and, in my opinion, it leaves the most even results. Yet I would use a stronger cleaner for occasional deep stains, and I wish Tuff-Stuff adopted a wider spray push button for added comfort. Shout Auto Multi-Purpose Cleaner — The spray is highly effective on deep stains yet the spray itself is not overly concentrated. The brush attachment on the Shout can is far easier to use than the permanently attached brush head on the Turtle Wax cleaner, but the Shout overspray is worse than with the Tuff Stuff cleaner. Clean the inside of your car in the shade on days when the outdoor temperature is between 60 and 85 degrees. Cleaners are less effective and may even cause damage to upholstery when it’s too cold or too hot. Protect other surfaces from overspray. You’ll want to cover glass, painted car exteriors, and other surfaces to avoid aesthetic damage. Open your car doors and windows when using fabric cleaners to help ventilate the inside of the car while you’re cleaning it and to reduce your chances of inhaling chemical fumes. Unless instructed on the product’s label to do otherwise, let the car seat cleaner set into the fabric for between 30 seconds and 1 minute to allow the agent to remove stains. You can remove excess foam spray with a cool, damp cloth. Only use car seat cleaners when you won’t be using your car immediately afterward for a period of at least a couple hours — after all, what’s worse than sitting on a wet, soapy car seat? Besides, you may cause more stains if you use your car seats while the fabric is still damp from the cleaners.